Aside from becoming the place under which the wedding vows took place, a wedding arch beautifies the ceremonial setting and its decoration can be used to embody your unique personality. After all, a wedding is essentially about the union of two souls in love. Shouldn't everything about the wedding be a reflection of the couple's characters and preferences? 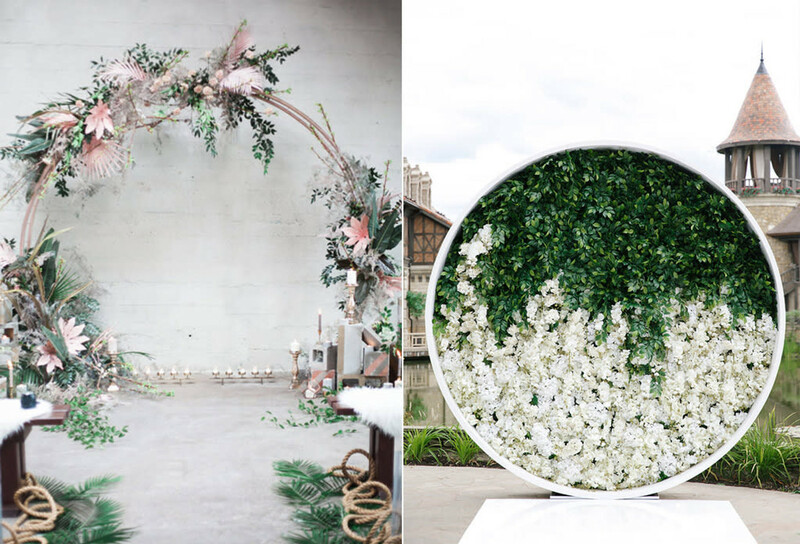 So today we have gathered 10 wedding arch inspirations perfect for a picturesque wedding ceremony. Start sliding through the slideshow right away! 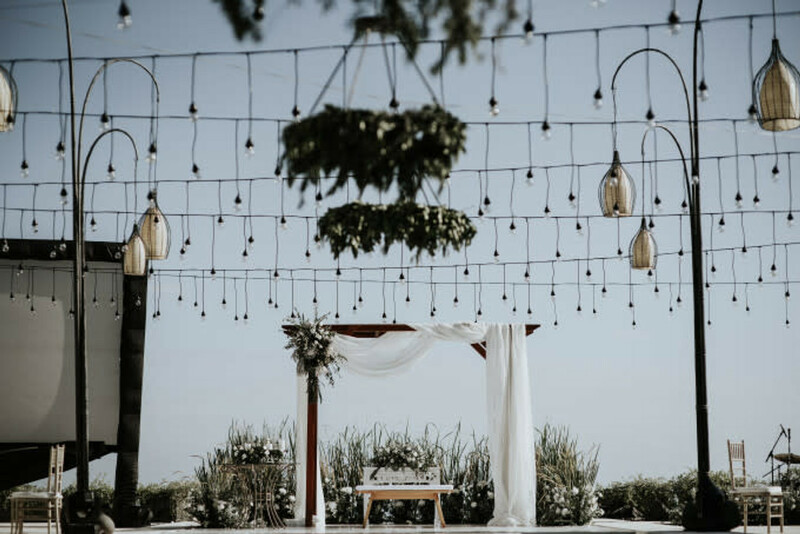 When you’re already blessed with a majestic view of the ocean, simple fabric draperies and clusters of flowers would be enough to provide a romantic atmosphere to your ceremony. 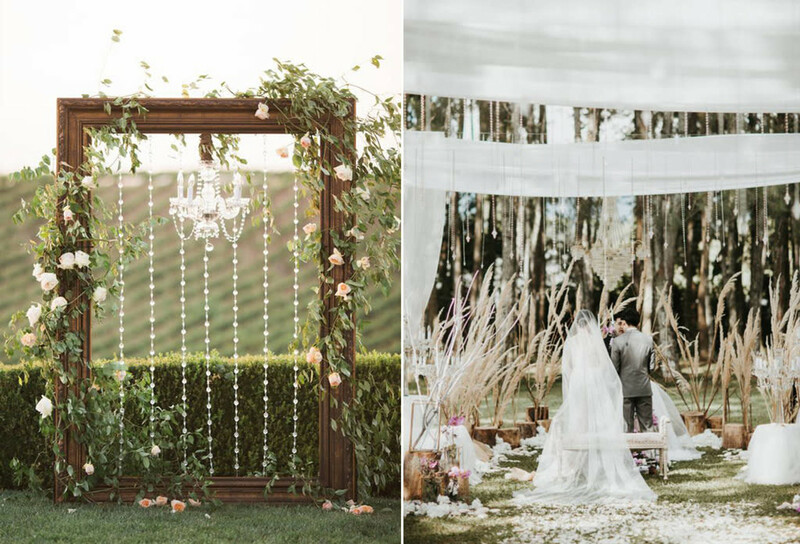 Planning to create luxurious aura for your open-air wedding ceremony? Hang chandeliers or crystal ornaments to instantly set the glamorous mood you're looking for. Take your ceremony to the next level by moving on from the traditional arch shape. Round-shaped arches are versatile enough to fit any wedding theme and venue, as it has a timeless structure. It will also add a unique value to your ceremony as your guests definitely won’t stop talking about it! A triangle-shaped arch will definitely make your ceremony unforgettable as it’s striking and refined. Don’t hesitate to use greeneries here and there to show off this unique structure. However, you can also decorate it with lush flower arrangements to channel your inner romantic too. Calling all boho brides-to-be! 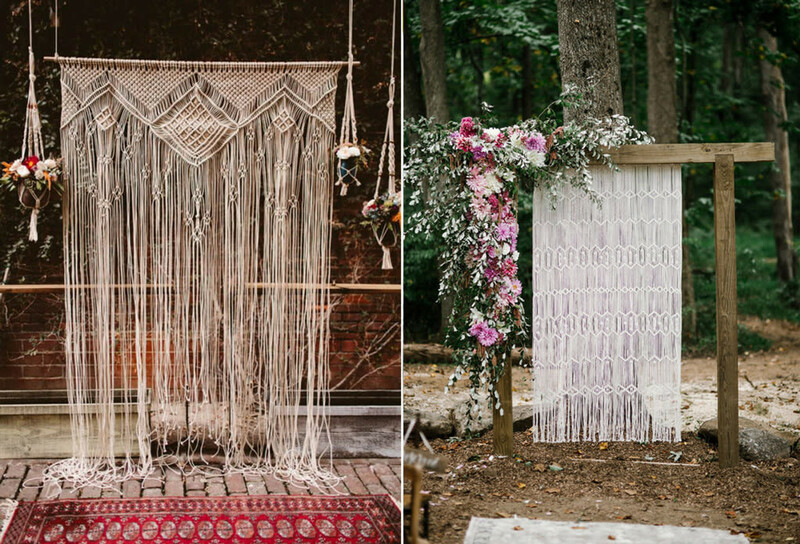 Consider a macramé backdrop paired with a bright-patterned rug for a rich bohemian feel. To subdue the bohemian influence, use a simpler rug instead. Whichever option you’re going for, your backdrop will remain as eclectic as ever. 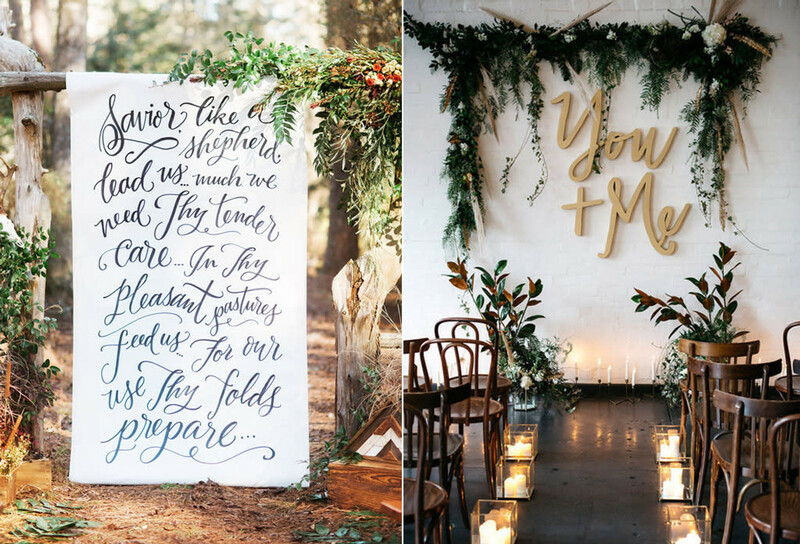 Whether it’s an indoor or outdoor ceremony, there can’t be a more profound backdrop than one with a hand-written quote for those who want to embrace their poetic souls. If you’re looking for something simpler, stick to initials or a short phrase as pictured above. Want to try something different? 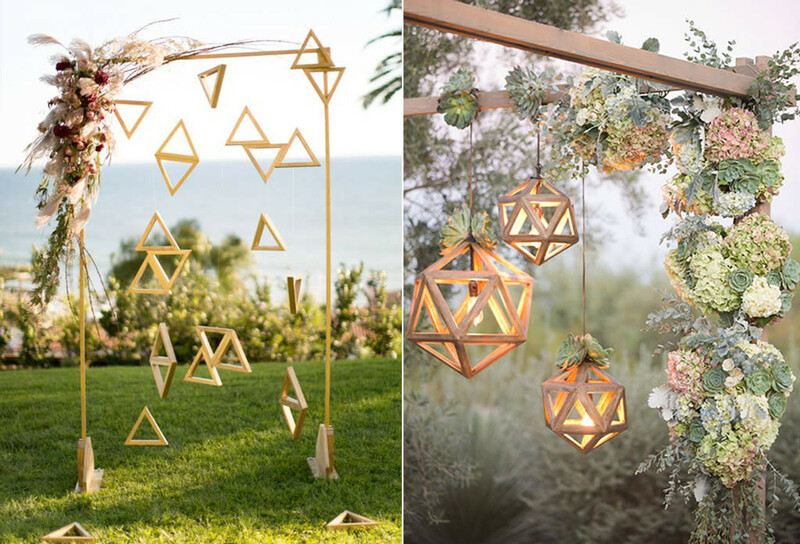 These bold geometrical elements will make your wedding arch stand out in an instant. Hang these fun elements to the structure for a festive effect! We think this idea is perfect for couples with a casual and fun wedding concept. 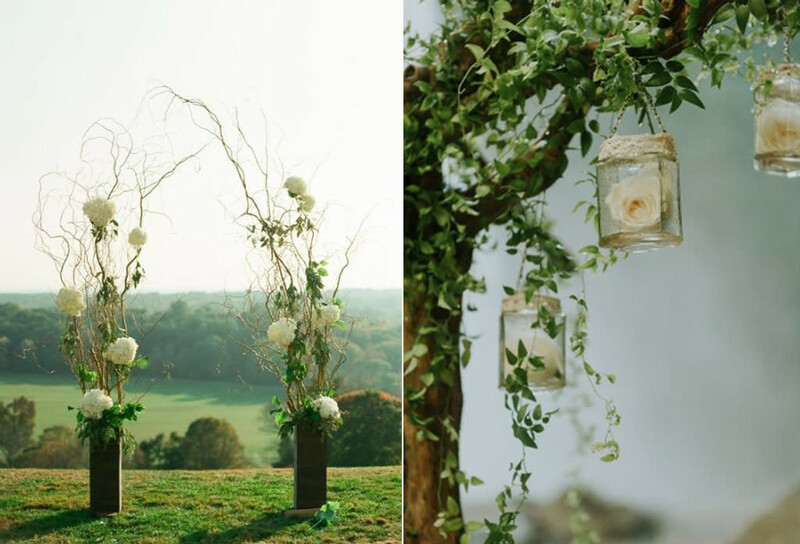 Brides who are into rustic weddings will love this idea. Build and decorate your wedding arch using only elements you can find in nature. Its understated beauty is just simply charming, do you agree? 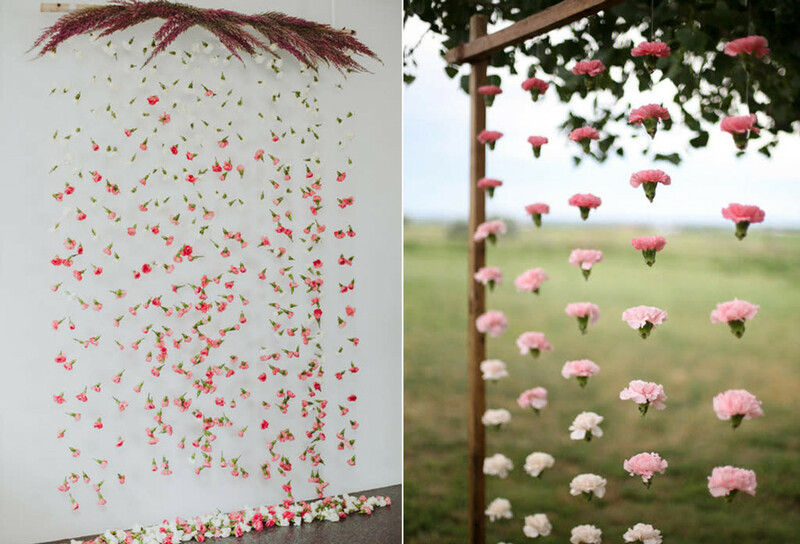 DIY brides who feel the need to adorn their wedding with a touch of creativity might find this idea very interesting. Indeed, you can always ask your vendors to re-create this look, but if you have the time and will to do it then by all means please do. You can use various shades of the same flower type, different flower types of the same color, and even various flowers with a range of colors too! 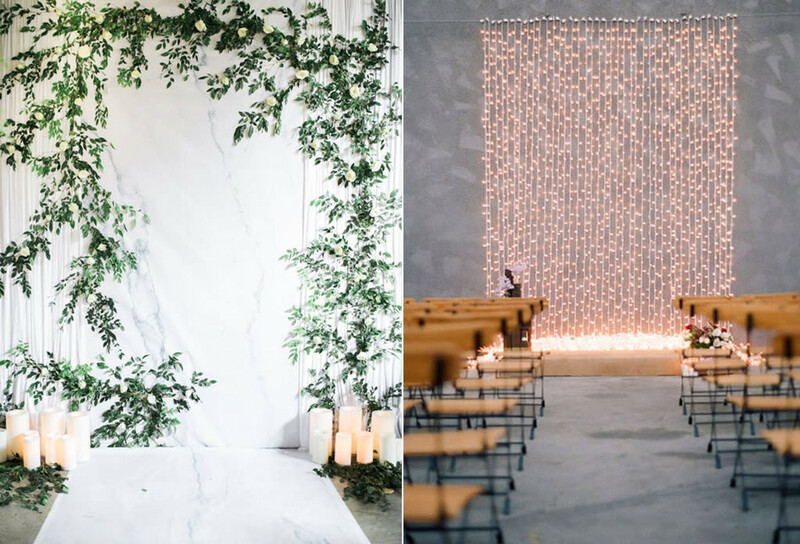 The ceremony is indeed a sacred moment, but it doesn’t mean that you can’t use unconventional themes. If you like the industrial look, a simple string light backdrop will do the trick. For brides with a modern flair, try the greenery-marble combo for an aura of sophisticated edginess. 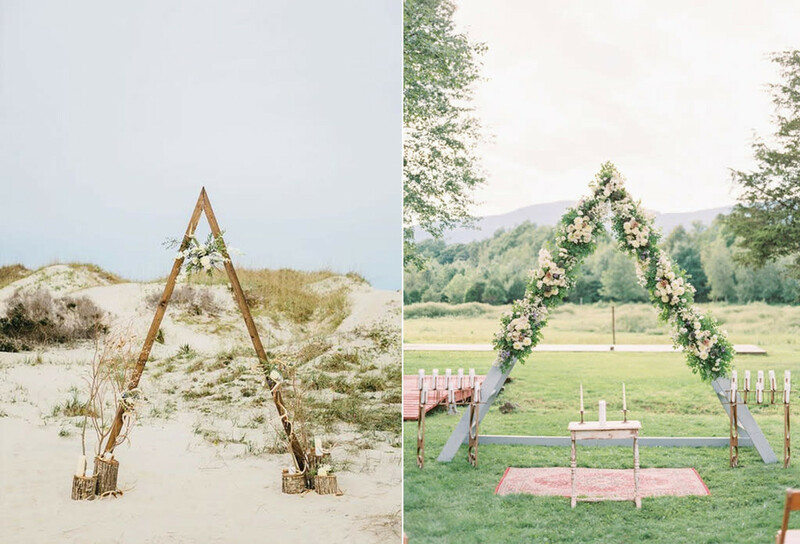 Do you have any other wedding arch ideas that can make a sweet remembrance? Tell us and let us know which idea is your favorite in the comments section below!